links | How can I recycle this? Drinks can bottoms necklace The other end of the cans – a great reuse since so many crafts using the pop tops or the sides of the cans, but I’ve not seen many using the stiffer curved bottoms. Fake shell-like pendants from bubble wrap Following on in the “you’d never guess what this necklace used to be” line, this tutorial shows you how to make shell-like decorations for jewellery from bubble wrap. Old jeans into placemats I think I’ve seen something like this before but it’s still a great idea – denim placement from old jeans, using the pockets as cutlery/napkin holders – cute! 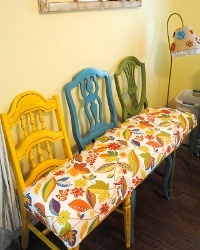 Very fun bench from three old chairs Speaking of cute, how fab is this bench made from old chairs? Old t-shirt wrapped bangles Revamp old boring bangles with old fabric from t-shirts or the like – two upcycles in one! Thumb-controlled watering can from an old bottle The simple on/off functionality of this quick creation from Hester at Fun in the Making would be perfect for watering little pots and seedlings in the garden without wasting water. As a fan of both buttons and nature, I think these buttons from twigs are great too. As the how-to explains, it’s a little tedious to cut them all with a handsaw but if you just want a few and don’t have a table saw, then it’s still a viable project. And speaking of the great outdoors, I’m planting out a lot of stuff at the moment. I’ve been using sliced up plastic bottles, drinks cans and other packaging for plant markers but these labels – made from skewers and wine corks – are very cute too. Roo has turned an old nightstand/chest of drawers into a unique and fun doll house – just a little handy work is needed before the fun decorating starts! Shopping lists save money & food waste but our lists and pens tend to wander from our kitchen noticeboard — they wouldn’t if we had one of these. The similar pretty wood backing/bulldog clip/elastic band idea would work well with reclaimed scrap paper as well as a new roll. 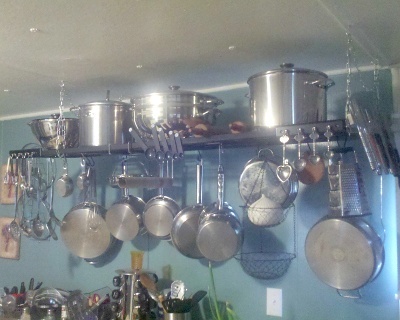 And finally, I had an email from Jackie: “I recycled this awning frame by making it a pot rack. A little bit of chain and I hooks and s hooks bring it all together” — looks great and super practical, great work. I’m often amazed what fab things people can make from old toilet roll tubes and these are no exception – fake wrought iron artwork. A great idea – I’m going to make some for our porch, reflecting the curled wrought iron railings we’ve got at the front of the house. They’d make fun picture frames too if you left out the centre sections. 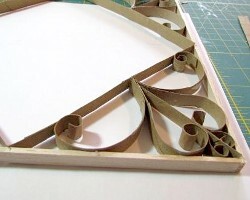 Speaking of which, I love this idea for making custom photo frames from old board game boards. It’s a lot warmer now than it was this time last month, but we’re still all about blankets & quilts here – and this is a great how-to from Daisy Janie on how to make a quick quilt from an old fitted sheet and some contrasting thread. Started spring cleaning early? Turn a plastic bottle into a drain declogger to clean the bits you can’t normally reach! 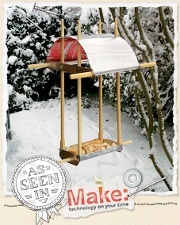 Want to learn how to make jewellery from recycled materials and are in the north-west of the UK? I’d heartily recommend Alison Bailey Smith’s workshop on the Wirral next month. I love this guide to adding better shaping to a too-big/unisex t-shirt – I’ve got about half a dozen shirts that I’d wear more if they fitted better. Definitely something for my project file. And finally, in case you haven’t seen it, I’m restricting the amount of clothes I buy this year – no more than 12 items over the year. You want to join in the fun too? 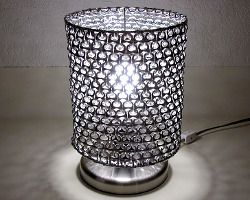 Have you spotted any great reducing, reusing or recycling how-tos recently? I love this idea since a lot of people have leftover stilton around at Christmas too. The already cooked turkey won’t need as long in the frying pan though – add it with the mushrooms rather than before the sweet potato. 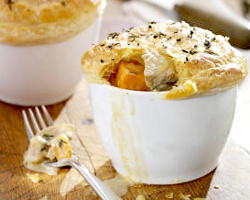 Making individual pies are also a great idea for this time of year when people are extra busy – these guys can be frozen then defrosted and cooked as needed rather than a big pie which has to be eaten all at once. Another fab recipe because you’ll have most, if not all, of the ingredients on hand from Christmas dinner preparations – such as root veg and streaky bacon – and the croutons also use up day-old/going-stale bread. If you’re really organised you can make the stock from the turkey carcass first too (see side panel below). Make a stock from the turkey carcass for use in soups and stews. If you’re not going to use it straight away, reduce it down to get rid of a lot of the excess liquid and freeze it. If you’re feeling lazy, slow cookers are great for making stock – just pile everything in. After stodgy roasts and puddings (mmm stodgy food), this recipe is refreshingly light. Not at all seasonal with the courgette and peppers but still, mmm! If you haven’t quite got enough turkey, pad it out with pinto or kidney beans. And keep with New World flavours, this is awesome and I’m drooling again at the thought of it. Leftover turkey, rings of some sort of smoked/spicy sausage, colourful veg and spices – a surprisingly quick but delicious option. Finally, I couldn’t do a leftover turkey round-up without including a curry – firstly, because turkey curry is a delicious cliche and secondly because I’m all about spiceness! This recipe from the wonderful people at LoveFoodHateWaste is effectively two curries in one – yummy enough on its own but transformed into something a bit more Thai flavoured with the addition of coconut milk. What will you do with your leftover turkey? What are your favourite recipes? With all the buy-stuff events coming up over the next couple of months – and because it’s generally wonderful and inspiring, I thought it was high time we had another look around the world of upcycled jewellery – the stuff people are making by reusing and recycling random things that would otherwise be headed for landfill. And second, Judith Williamson’s jewellery and accessories made from old packaging – mostly tinplate from old sweet/biscuit tins. Mary also recommended Judith’s workshops: “good fun”. Fluxplay’s Maria Whetman also works in tin – I love her rings but I have to admit that this cute pinwheel brooch is probably my favourite item! Kathy from ArtworkbyKD makes fantastic earrings from old plastic bottles – covering the plastic in tissue paper and vintage texts to upcycle them further. She also uses old drinks cans – one of my favourite recycled jewellery materials – to make big hoop earrings – ace! 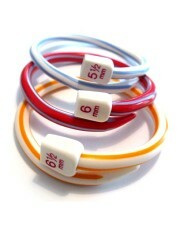 LianaKabel makes very fun items using old craft equipment – plastic knitting needle bangles and statement necklaces, and also brooches and hairclips using tape measures. The House of Ismay makes deliciously simple brooches and cufflinks using off cuts of wood and vintage magazines, books and maps – sometimes less is more. The main “ingredient” in these earrings by Bella Tierra Jewelry is plastic bags – fused together to make a interesting, malleable material. And there is a how-to if you want to make your own! And another how-to – Alicia of TheMayFly has written a great tutorial: how-to make old belts into wrist cuffs. Finally, if you need somewhere to store your jewellery – somewhere as fun and wonderful as the creations above – how about using an old tennis or squash racket? I regularly see vintage wooden ones popping up in charity shops – they’d look fab on a plain wall. What are your favourite pieces? 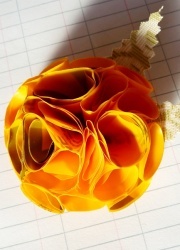 Do you have any other great examples of random stuff recycled or upcycled into jewellery?